I'm late to join in this fun event, Park City Girl's Quilt Festival, but hopefully not too late. Shoot, I'm late for most everything so being late for this comes as no surprise to me! Below is the quilt I've chosen to highlight in my first ever quilt show. I had so much fun looking through my quilt images. Choosing one was no easy task as so many of them carry special memories and meanings. But this one, made from scraps that I absolutely love, is certainly high on my list of favorite quilts ... so much so that I'm planning to make another, similar one, very soon. The squares are randomly pieced over muslin and then finished with lots of decorative stitching. The border is done in the same manner, but in long strips instead of squares. The squares are set off by the white sashing. The backside of the quilt is an orange checked fabric. More about the quilt here. Those of you enjoying the tour of the quilt festival ... relax, put your feet up, have a cup of tea (yes, you can eat and drink at this quilt show), and have a look around. I'm glad you're here and welcome you to come visit anytime! Gorgeous, I love the way the white brings out all the colours. this is FABULOUS, so many intricate details and gorgeous craftsmanship! and beautiful eye for color! i love the technique! Really cool quilt. Very colorful and cheerful. What a lovely way to emphasize the crazy quilting and decorative stitching instead of having it all in together. 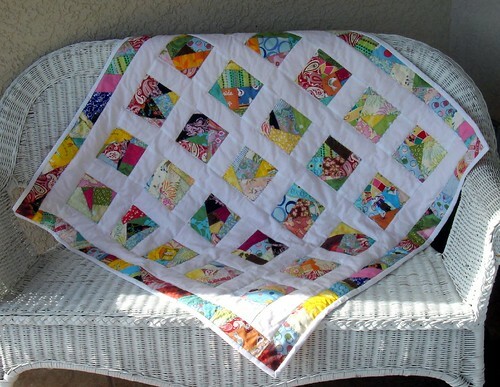 This is such a lovely quilt! I had to laugh at your story of wanting to share when, why, how you bought each fabric with someone who would buy the quilt...I know exactly what you mean! 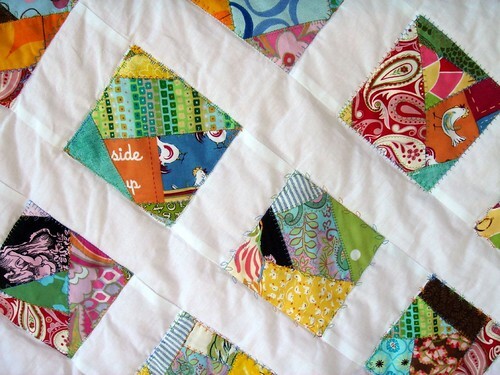 Crazy quilt blocks with white. Very pretty. Ooohh...I love this! I need to try crazy quilting. The white really makes the bright colors in the block pop. I love it, especially the decorative stitching. What a great idea! Beautiful! So crisp and clean, but full of surprises up close! This quilt is really gorgeous. Simplistic but also very involved. It looks clean. I love it and great work. Oh I love this. I've got several squares made up and wasn't sure how to put it all together. I like what you've done! Very pretty! Lovely quilt, I should have done what you did, and posted more than one photo of my quilt. The white sashings really make the blocks look bright and lovely. Love your quilt and the black and white wonky stars as well. And your blog!! I just decided to use my black and white fabrics to make a wonky star block quilt... so wonderful to see yours! This is gorgeous...I keep changing my mind on what scarppy pattern I am going to follow (just organized the scarps) I may have to "borrow" this idea! The wonderfully lively colours contrasted with the white is just so eye catching.......LOVE IT! What a wonderful quilt. I love how the white makes the squares pop out. Great job. I love this quilt! It is so happy and fun! Beautiful. 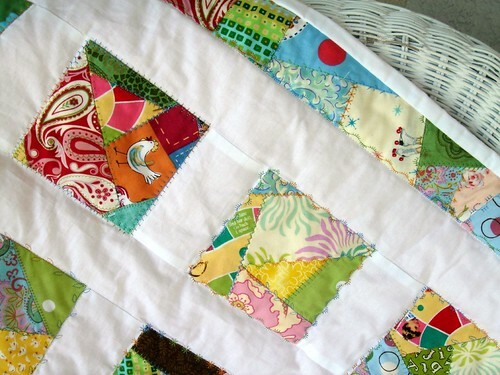 I like the crazy quilt in the squares which are so vibrant with the white border. It is inspirational. I saw your comment on my post...and you are right.....I never said if the baby was a boy or girl. The baby is a girl and more joy than we ever imagined. Her name is Alethea...which is greek for truth. Kudos to you for homeschooling your kids. I did it until high school. Although, this looks like one of many of your hats you are wearing! I love the scrappy love your beautiful quilt. Great job!!! I love I love I love. Oh it's so beautiful! I want one. I love you color sense. Though not quite conventional it is fantastic. As I looked at the blocks and the pieces you chose to put together I realized that you have a feeling for color that isn't simply by the rules and I appreciate your innovations. Lovely! And what a great idea to break up the crazy blocks with sashing! I'm going to try that with my crazy quilt WIP. very pretty quilt! Thanks for sharing it! I love how the yellow skips across the quilt. pretty pretty!